Traveling Tuesdays for the Letter ‘H’ is going to highlight The Holy See. I had a visit with my sister, Ruth, while she was in Dublin, Ireland. I had the opportunity to help her with her filing and one piece I filed was an unclassified document for the Holy See. When the Head of Mission first comes to reside in a country, they present their credentials to all the Missions in the Country and each Embassy sends letters of welcome as well. 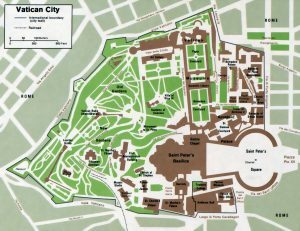 This was the first time I realized that the Vatican was part of the country called the Holy See. The Holy See is an independent sovereign entity. As an independent state, holding the Vatican City enclave in Rome as well as many other missions in the city of Rome itself, it maintains diplomatic relations with other states. 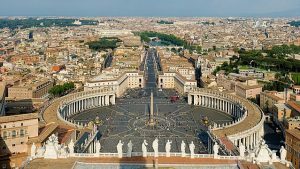 The Holy See is not the same as the Vatican City State. Ambassadors are officially accredited to the Holy See and are recognized as representing the Holy See. The creation of the Vatican City State was meant to ensure the diplomatic and spiritual independence of the Pope. 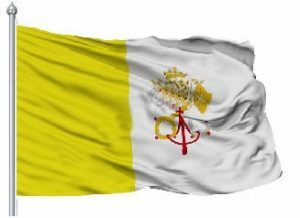 The flag of Vatican City was adopted on June 7, 1929. This was the year Pope Pius XI signed the Lateran Treaty with Italy, creating a new independent state governed by the Holy See. The Coat of Arms of the Holy See and the Coat of Arms of Vatican City have the gold and silver keys reversed. I have had two trips to Vatican City. The first time I was on a Trafalgar Under 30’s Tour of Europe. The tour included a city tour of Rome and we saw the Coliseum and the Catacombs and then our bus took us into Vatican City. We were in St. Peter’s Square and also had a tour of the Sistine Chapel. The second time was while I was teaching in Kuwait. I went to Italy with a colleague and his wife. We stayed in a timeshare outside the city and drove to Rome. Leaving our vehicle close to the metro, we used the local transportation system and found our way close to the Coliseum and entered Vatican City and saw some of the same things I had seen 30 years before. 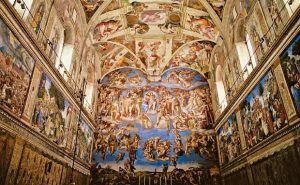 The difference was the Sistine Chapel was getting a face lift and there was scaffolding blocking the perfect shot of Michael Angelo’s amazing painting. Regardless of one’s religious beliefs and denominational preference, the sites in Rome and in Vatican City bring scripture alive when one reads the books of the New Testament. The biblical book Romans tells of Saint Paul’s journeys and many of his other letters were written while he was in prison in Rome. Be sure and come back next week as we travel to a country starting with the letter “I”.